Córdoba is Argentina’s second largest city as well as the capital of the province with the same name. It has become a recognized historic and cultural center due to its strategic location in the heart of the country. Cordoba, known as “La Docta” (from the Latin docere, meaning “to teach”), has become the home to more than 130,000 students from around the world who seek to gain not only academic knowledge but also cultural immersion. Experiencing Cordoba’s surrounding nature and wildlife destinations is an absolute must. The nearby lakes and rivers attract water sports enthusiasts from around the world, while local mountains and valleys are ideal for hiking, horseback riding, rock climbing, hand gliding, and other outdoor activities. This modern city, with its state-of-the-art shopping centers and 5-star hotels, stands out among other important capital cities worldwide. The Cordobés charm cannot be missed in the numerous nightlife activities, which include restaurants, shows, dance clubs, and pubs. In terms of industry, Córdoba is known for its automotive factories, cement and aeronautical production, oil and dairy manufacturing, among other businesses. Córdoba, with its warm and inviting inhabitants, offers students the unique experience of being fully integrated into Argentine lifestyle and customs. Founded in 1573 on the water’s edge of the Suquía river, the city of Cordoba is famous for being the greatest cultural and services center after Buenos Aires. It has a historic center with one of the most valuable heritage in the country, with a number of churches, convents and old houses dating from the 17th to the 19th centuries with remarkable artistic and architectonic value. The Cathedral, the Compañía, Santa Teresa, and Santa Catalina Convents, the House of the Marquee of Sobremonte, and the Rivera Indarte Theater – all found in Córdoba – are among the various outstanding monuments in Argentina’s architectural heritage. Additionally, it was in this city that the country’s first university was founded by the Jesuits in 1613, which is not only the oldest university in the country but also one of the first in Latin America. Córdoba is currently the second biggest city in the Republic of Argentina, with a population of approximately 1,250,000 inhabitants. Two recommendation letters from university members. A letter from a parent or other party assuming financial responsibility for the student’s participation in the program. International fee: Includes compulsory Health Insurance and extracurricular activities (paid within the first week of arrival at UBP). Most UBP classes are conducted in two 90-minute sessions per week (4 academic hours). The total length of the courses is 15 weeks. Students may register by the end of the orientation period each semester, after completing the necessary payments. Students who apply at Universidad Blas Pascal are strongly advised to contact their academic advisors so as to determine the transferability back to their home institutions. Those who participate in our program through our affiliated institutions should have no difficulty in transferring credits. Additional information regarding our course offerings can be sent when necessary. Transcripts are printed a month after the completion of classes. The original certificate is then sent by post to the participant’s home institution, together with a scanned copy sent by e-mail.The Student Visa is MANDATORY for studying at University Blas Pascal. Those students who do not present a copy by the end of the program will not be issued a Transcript of academic performance. Obtaining a STUDENT VISA is the SOLE RESPONSIBILITY OF EACH STUDENT. Each student is responsible for obtaining his/her STUDENT VISA, and must process it within 30 days upon arrival. It has a MANDATORY character. UBP provides advice to students on how to obtain it, after their arrival in the city of Cordoba, but is not responsible in any way for its obtainment. Inscription in the student exchange program (this document will be provided by Blas Pascal University). Migrations Fee of $600 pesos (approximately USD $80) upon initiating the procedure in the National Direction of Migrations. * *Members of MERCOSUR are requested to bring a certificate of deficiency of criminal records in country of origin or countries in which residing for the last three (3) years. 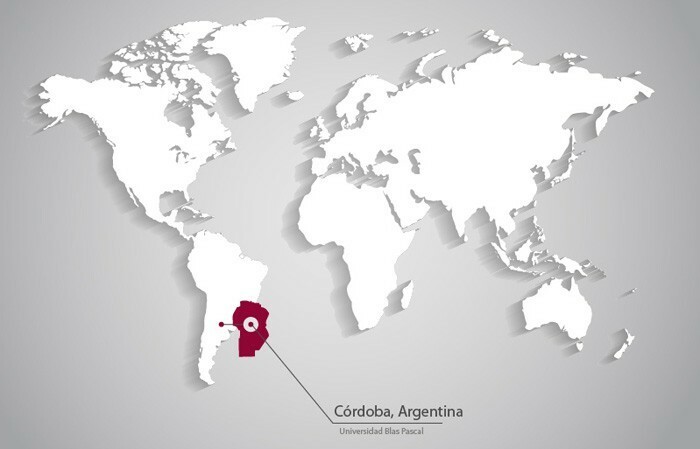 It must be legalized by the corresponding argentine consular representation, or with apostille (A document which has been certified with a conformant apostille is accepted for legal use in all the nations that have signed the Hague Convention). Students that REQUIRE A VISA TO ENTER TO ARGENTINA MUST contact their closer Argentine Embassy or Consular Section in their country of origin or residence for advice. – Name and surname, passport number, nationality and date of birth. To enter Argentina, citizens of the countries listed below must pay a “reciprocity fee”. The collection of this “reciprocity fee” is NOT A VISA, since Argentina does not require visas to citizens of those nations for tourism or business. UBP recommends that students pay the fee before coming to Argentina on-line, by accessing this site: http://www.migraciones.gov.ar/accesible/templates/reciprocidad/reciprocidad.htm to avoid delays at the airport. Home-stays are a very important part of our programs in terms of integrating the student in the Argentine way of life. Our total immersion method extends beyond the classroom and includes lodging in a friendly Argentine family. All families have been carefully selected and are monitored to ensure complete satisfaction of the home-stay experience. We highly value student integration in Argentine everyday life, as it is fundamental to understanding local values, customs and culture. The International Relations Center offers students the possibility of being hosted in a selected family’s home so that their stay may be warm and pleasant. There is always someone willing to help the newcomer meet the challenges of adapting to a new environment. This is one of our program’s features which international students have found most rewarding. The tutor will share conversations, activities, excursions, trips, and nightlife, and will be a vital part of the student’s experiences and social life in our city.